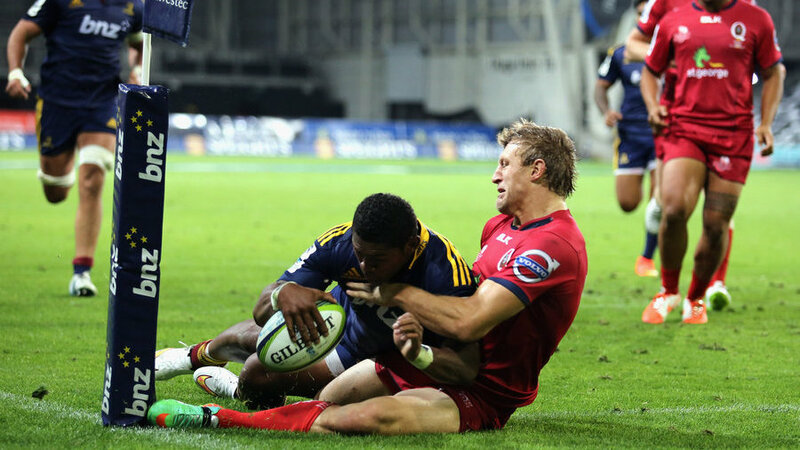 Marty Banks trumped James O'Connor in the battle of the new No.10s, as the Highlanders lodged their first Super Rugby win of the season, 20-13 over the Reds in Dunedin. Both sides remained tryless in the opening half despite several explosive runs and strong breaks, but it was the Reds poor discipline and Banks's boot that proved the difference between the pair with the Highlanders converting four of the five penalties. Star Reds' recruit O'Connor didn't disappoint in his much anticipated return to Super Rugby, despite some fundamental mistakes, with the 24-year-old making an early break with his first touch of the ball. Cutting straight through the Highlanders defence, O'Connor came within metres of the tryline before he was brought down. But despite O'Connor and Will Genia's half pairing making strong breaks down the field, the Reds struggled to put points on the board, with O'Connor converting one penalty in the opening half. The Highlanders had problems of their own with the side finding plenty of space and getting within metres of the line several times, but they two struggled to get across the line with the side relying on Banks's strong boot to put three penalties on the board and head into the break 9-3 up over the Reds. It took only six minutes for the Reds to turn things around in the second half, with Genia making a huge break and crashing over the line only to be held up by his opposite Aaron Smith. The Reds continued to hammer away at the Highlanders defence, and eventually saw Jake Schatz over the line after he found a gap from behind the scrum five metres out from the line. The Reds lead was short lived however, with their poor discipline catching up with them again and the Highlanders were given the chance to hit back quickly at the restart with Banks converting a fourth penalty, before Waisake Naholo managed a way to stay in play and bounce out of a Lachie Turner tackle to put the ball down in the corner. "I think our discipline let us down again, too many penalties in that first half gave them a really good bind, gave them a head start," Slipper said following the match. "We we're playing catch up from there on. It was a tough game, but something we can learn from." "It was tough out there, it was a good Highlanders pack. We were pretty disappointed with the result at the set-piece, so we're going to have to go back and work hard at the set-piece before we go back and take on the Waratahs next week. Both sides continued to fight it out in the final minutes, but despite a last minute penalty to O'Connor, the Highlanders were just too far ahead and held onto their opening win of the season. Highlanders' captain Ben Smith was happy with his side, especially with Banks in his first match at fly-half. "He's awesome. He played really well tonight, directed us around the paddock and was good to get the win. I liked the way we held them out, the boys played well. Yeah it's good to get a win." "They've got some good x-factor players, so we did expect that, but I think we countered that pretty well."